Every once and a while you walk into a room and find yourself face-to-face with something so exquisite, you cannot quite catch your breath. If you’ve visited Fine Art Kangaroo Island recently, it’s likely you’ll know exactly what I’m talking about. 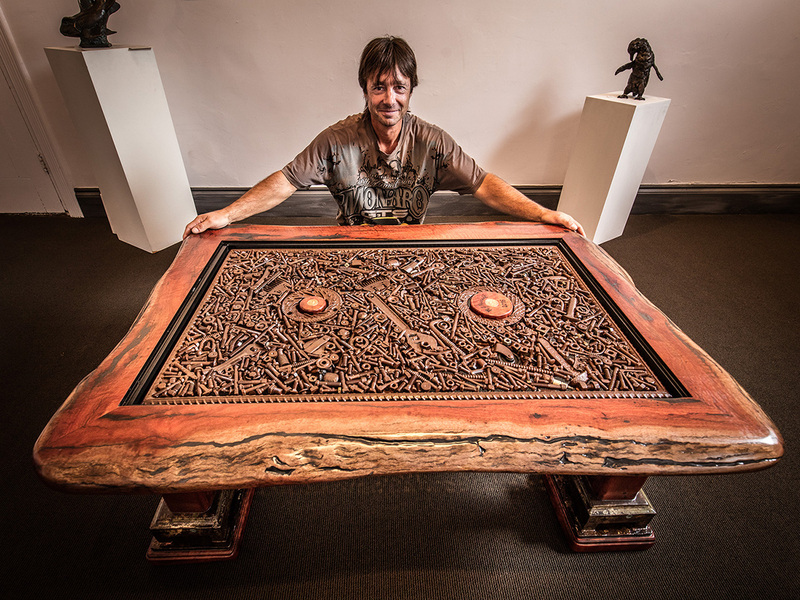 The first time I came across this breathtaking bespoke redgum coffee table by Kangaroo Island timber artist Mark Russell, I did literally stop in my tracks. An unforgettable example of timber art furniture, everything about the piece is exquisite. The massive redgum slab that forms the table top is from a decades old river log, and was joined using modern joinery techniques. Its beautiful natural lines contrast perfectly with the cast iron legs which began their life as verandah post bases from an historic home owned by the Kowald family at Caloote, in South Australia. 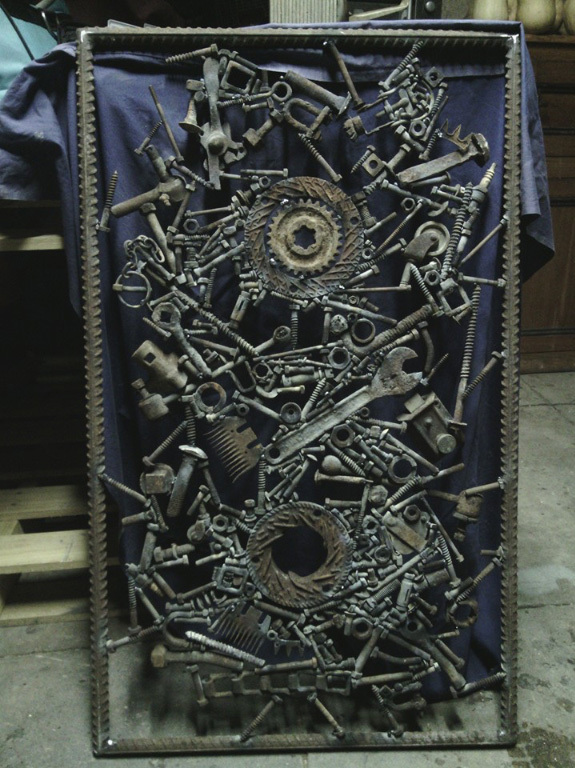 There is so much more to the metal art sculpture inset than meets the eye. When your eyes fall upon the edgy, industrial style metal art inset captured under glass, it’s a fair bet you’ll be captivated as I was. In fact I’ve been back several times since, drawn time and again to marvel at the artist’s ability to create such a visually striking design piece from a seemingly random collection of workshop treasures. But there’s so much more to the story of this fascinating art piece than you’d imagine. Consider the artistic vision required to create this design while building it upside down as each of the approximately 1600 components were individually welded together. 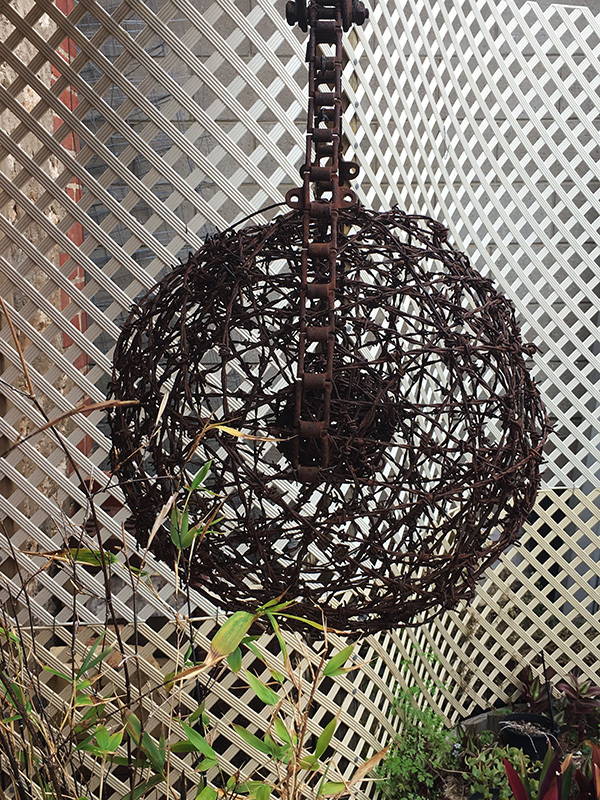 Once the metal assemblage was complete, it was grit blasted and put back in the weather for two months to rust again before being wire brushed and coated in industrial clear lacquer. 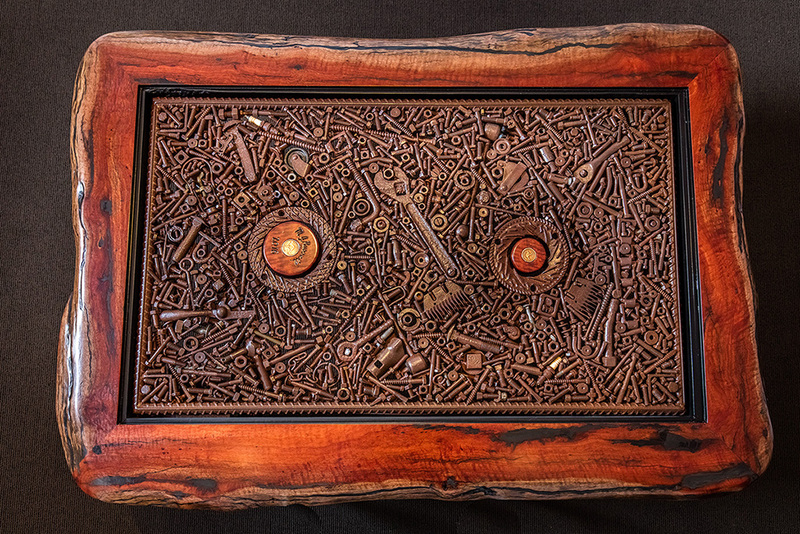 Rusted steel components featured in the table top include vehicle parts, tools, shearer’s combs, hardware and machinery parts, and nearly every type of bolt and thread from Mark’s grandfather’s collection. These are contrasted with copper pennies, brass and ceramic features. By now I’m sure the two shiny pennies have attracted your attention. Both have been carefully set into rounds made from a rare form of redgum called fiddleback. With 25 years of experience working with native redgum, Mark has built countless tables and other items, finding fiddleback in less than 5% of the timber he has slabbed. Stunningly crafted, and sure to be a source of constant curiosity, you’ll need an impressive space to do this incredible piece justice. All materials have been sourced from Kangaroo Island, Murraylands and far beyond. Mark is a re-formed perfectionist who visited the Island from his former Murray Bridge home for over 20 years before moving here to live. His ability to bring together the warmth and beauty of natural Australian redgum timbers with the edginess of industrial metal art, clearly stems from a diverse work background, through which he has always been connected to materials. Mark began his work life as a fitter and turner, but soon developed a life-long passion for redgum. Using his timber of choice he restored and fitted out an historic BnB creating uniquely designed furniture and fittings from his studio on site. But if you think you have a handle on Mark Russell’s artistic talent once you’ve seen what he can do with native redgum timbers, you’ll need to take a step back and reconsider. There are times when Mark draws solely upon his ability to work with metal, in all its forms, to create the most stunning and unexpected sculptural pieces. 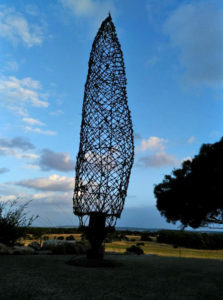 Take a walk through the Wabi Sabi Garden at the rear of the Fine Art Kangaroo Island Gallery, and you’ll find several of his works in barbed wire, including a spectacular “Pencil Pine” sculpture which is lit at night. Whatever the medium, Mark’s meticulous sculptures and timber pieces are crafted from personal collections of family and found objects including some sourced on KI. Mark Russell is a fascinating new artist whose work will likely bring more attention to Kangaroo Island art. Keep an eye out for new work from him in the future.